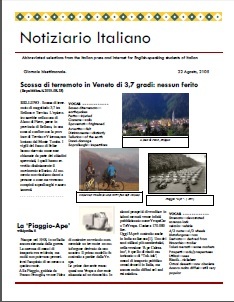 This page contains frequent pdf’s of current items, mostly in Italian about things Italian. 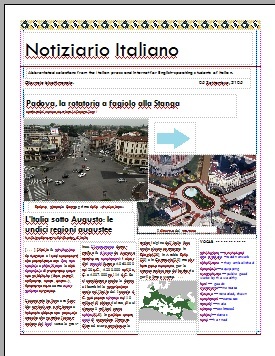 The material has been taken from the Italian press and related Italian internet sources with links to the originals. The idea is to provide varied, short, supplementary reading material, with vocabulary, for people in the Italian language course in which I’m a student. Big change to the centre of Padua, Snippet of history about Italy under Augustus Caesar, Note on Castel Fragsburg in Merano, About the french minister of Ecology and Energy, the Treviso Rock Festival, What does WordReference.com have to offer ?, Uber hires two hackers, Marquez wins the Indy Motorcycle race, Astrosamantha , Wes Craven – creator of Freddy Kruger – dies.